Using the latest technologies, such as Wi-Fi supporting the 2,4 and 5 GHz frequency bands as well as Bluetooth, multiple ways of connecting to the machine via radio are possible. CANwireless allows wireless connection directly from the existing ifm tools for mobile control systems such as Codesys or the Maintenance Tool. In addition to the connection between PC or mobile end device and the mobile machine, machines can also be connected to each other and exchange information. The device thus supports the technologies of Industrie 4.0 and the IIoT to make machines even more intelligent. 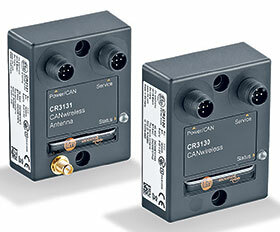 CANwireless enables a wireless connection to the CAN bus in a vehicle or machine. With the two basic operating modes ‘Infrastructure’ and ‘Mini Access Point’, the module is able to create a connection in different ways. In the operating mode Infrastructure, a CANwireless is configured to connect to an existing Wi-Fi infrastructure. When connected to the network, the device can connect automatically to another network participant (client) or listen to incoming connection requests (server). CAN bus data can be exchanged with other connected network participants. Configured as Mini Access Point, the device will create its own Wi-Fi network to which multiple other devices CANwireless devices, PCs, smartphones or tablets can connect. As in the Infrastructure mode, the device can act as both client or server in its own network. Data on the CAN bus of the Mini Access Point device will be shared with the other connected network participants. Tools like Codesys and the Maintenance Tool allow the use of CANwireless as interface to the machine. If required, CANwireless devices can filter data to be transferred by radio, which reduces the data load and increases the operational reliability.